Jordan Devlin and Travis Banks continued their feud but did not manage to resolve it, as they went to a double countout in an intensely fought, great main event. Pete Dunne addressed the crowd to open the show and got interrupted by Gallus. As Joe Coffey cut a promo on Dunne, WALTER made his entrance and he and Dunne cleaned house on Gallus, then had a staredown. On the undercard, Nina Samuels beat the debuting Lana Austin, while Eddie Dennis returned for the first time since losing to Dave Mastiff at TakeOver and destroyed Jamie Ahmed. - The show opened with a recap of Jordan Devlin attacking Travis Banks as he entered the arena and then again before their scheduled match at NXT UK TakeOver: Blackpool two weeks ago. It then progressed to Banks vowing to take revenge. Vic Joseph and Nigel McGuinness talked more about the match in studio. - Pete Dunne came to the ring to address the crowd. He said that at TakeOver: Blackpool "we made history!" He said that while things changed since the first show in Blackpool two years ago, since TakeOver: Chicago in 2017, he's still the WWE United Kingdom Champion. Gallus came out, with Joe Coffey saying that TakeOver didn't change a thing and this was still his kingdom. He said that the war wasn't over and the end of it, the UK title would be around his waist. He said if anyone had a problem with that, they should speak up. At that point, the lights went out, the fourth movement of Antonín Dvorák's Symphony No. 9 hit, and WALTER walked to the ring. Gallus suddenly looked like they wanted to quickly leave ringside, but it was a ruse as Wolfgang and Mark Coffey hit the ring. WALTER kicked Coffey in the face and Dunne snapped Wolfgang's fingers, sending the heels packing. Dunne and WALTER then stared at each other, with WALTER eyeing Dunne's title before leaving. - Sid Scala made a statement in front of some journalists about NXT UK being part of the Worlds Collide tournament in Phoenix for Royal Rumble Axxess this weekend. Scala said they also would tape three episodes of NXT UK there. Zack Gibson and James Drake entered the venue in the background. Scala asked them if they wanted to address the media. The tag champs virtually blew Scala off and Gibson said they'd give a statement next week. Austin made her NXT UK debut here. She started out in 2013, was a regular with Future Shock Wrestling, and also appeared for promotions such as ICW, ATTACK! Pro, Pro Wrestling: EVE, and a large number of other UK indies, and also wrestled at at a UK taping for Impact. She is a mother of three and is the current Future Shock Wrestling Women's Champion. Austin started out strong, but Samuels grounded things to a hold with a headlock, then hit a snapmare for a two count. Austin got out of another headlock with a Russian leg sweep and hit a number of clotheslines and punches. Samuels finally managed to pick Austin up and hit Prima Donna for the victory. - A recap video of the NXT UK Tag Team Championship tournament finals from TakeOver aired, with Gibson and Drake beating Moustache Mountain. An interview that Radzi Chinyanganya conducted with Moustache Mountain after the match was also shown. Trent Seven was devastated -- but Tyler Bate said that they would eventually win the titles. - Travis Banks was shown warming up backstage. - An interview that Radzi conducted with Toni Storm after her match at TakeOver aired. She said that the brand deserved the best women's division and she would do everything to give the fans that. She said the Mae Young Classic changed her and the experience helped her win the NXT UK Women's Championship. Dennis charged in, but Ahmed took over with a hip toss until Dennis hit a hard lariat to quickly end that flare-up of offense. Dennis locked on a cravat and kept the hold on even after Ahmed tried rolling through on it. Dennis hit a hard knee and threw Ahmed out of the ring, then struck him down with a hard running forearm. Back inside, Ahmed escaped the Severn Bridge and hit a boxing combination, but Dennis stopped him in his tracks after he went to the top rope and hit a big superplex. Dennis hit the Next Stop Driver for the victory. - A Tweet by Johnny Saint was shown, announcing Moustache Mountain vs. Marcel Barthel & Fabian Aichner for next week. - Jordan Devlin was shown preparing backstage. The match started off hot as Banks ran down to the ring and immediately attacked Devlin, quickly clotheslined him to the outside and hit a suicide dive, and then hit a second one to another side of the ring just as Devlin recovered. Banks threw him over the barrier and manhandled him in the crowd, eventually kicking him back to the ringside area, then hit a dive off the barrier on Devlin. Devlin eventually clipped Banks' knee, but Banks came back with a double stomp onto Devlin's back from the apron. Banks punished Devlin some more with aggressive kicks. Devlin took over by kicking Banks off the turnbuckle on a springboard attempt and followed up with a backstabber. He hit his over-the-shoulder backbreaker for a near fall, then followed it up with his uranage/standing moonsault combo. After some submission holds, Devlin hit an insane standing Spanish Fly off the apron to the outside, and both men barely made it back into the ring. Devlin hit another Spanish Fly off a clothesline attempt by Banks, but Banks powered right back up and hit a super stiff lariat. Banks wouldn't let go of Devlin's wrist, hitting a number of forearms. When even a headbutt couldn't loosen the Kiwi Buzzsaw's grip, Devlin hit his pull-up backdrop driver. Banks managed to hit the Kiwi Crusher, but Devlin kicked out at two. Devlin went for Ireland's Call but couldn't hold Banks up. They both staggered through the ropes to the outside -- and neither man could make it back to the ring to answer the count. Neither wrestler was happy with the result and they began brawling again, with Banks throwing Devlin over the barrier. They brawled beside the crowd as the show faded to black. 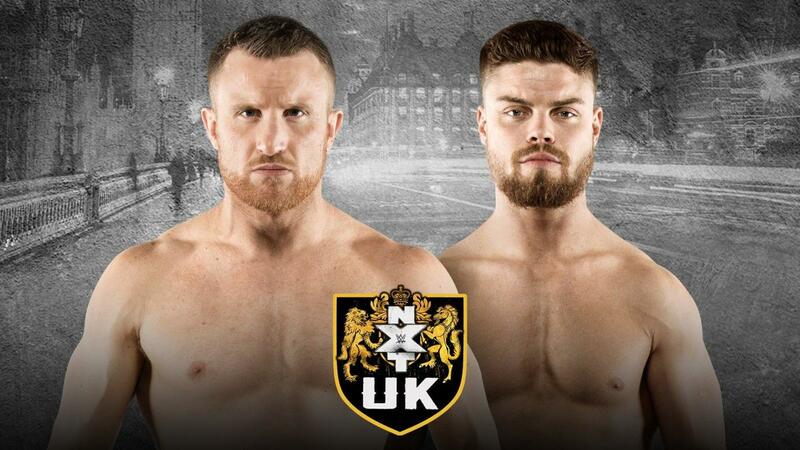 Moustache Mountain face Marcel Barthel & Fabian Aichner -- and WALTER makes his NXT UK in-ring debut.